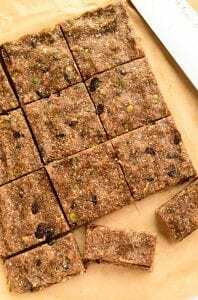 These healthy no-bake energy bars with hemp seeds, chia seeds, walnuts, cinnamon and raisins make a great alternative to store-bought granola bars. They’re vegan, gluten-free, easy to make and have a delicious oatmeal raisin flavour that makes a great snack, breakfast or dessert. Although these Vegan Oatmeal Raisin Bars with Hemp and Chia Seeds are easy to make, don’t dare underestimate their talents; they packs oodles of flavor and an energetic kick. Did I mention they taste like oatmeal raisin cookies? Well, they do, and they make smart snacking feel a smidge decadent. 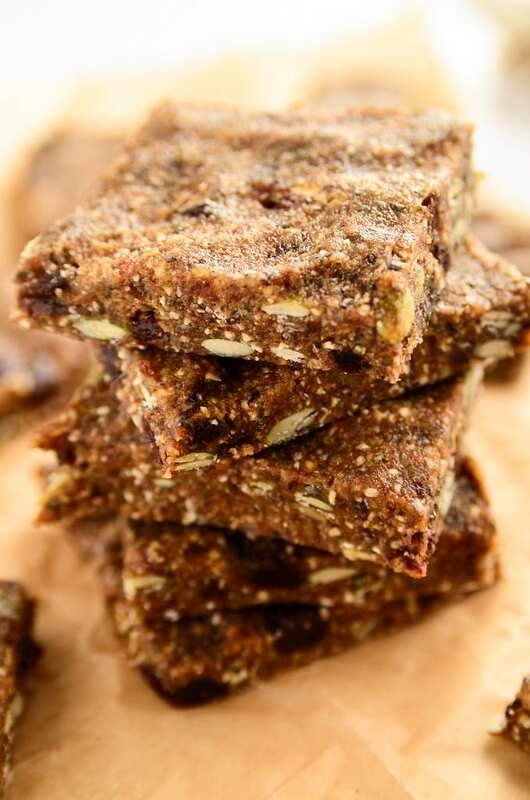 Plus, each and every ingredient in these bars extends a generous nutritional offering (e.g., hemp seeds = complete protein source, dates = rich in fiber/potassium/iron, walnuts = rich in Omega-3s, etc.). To make these bars, you’ll simply toss dates, oats, walnuts, hemp seeds, chia seeds, cinnamon, and a pinch of nutmeg into a food processor. You’ll process until a crumbly mixture is formed and stir in raisins and pepitas to add texture and a dash of color. After pressing the mixture into a pan, you’ll pop it in the freezer to set for a hot chilly minute. Then, you’ll slice into squares and enjoy. Here’s to having our health and eating blissfully too. 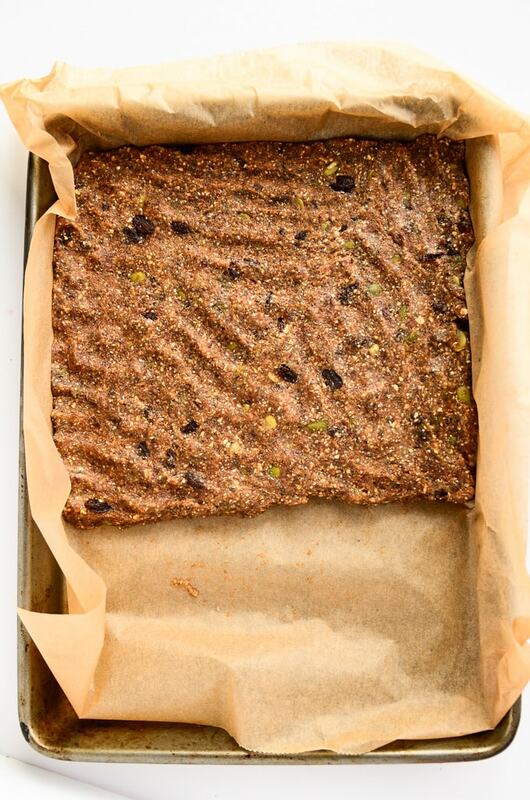 These healthy no-bake energy bars are loaded with healthy ingredients like hemp seeds, chia seeds, pumpkin seeds, walnuts and oats. Try them for a quick breakfast, snack or dessert! 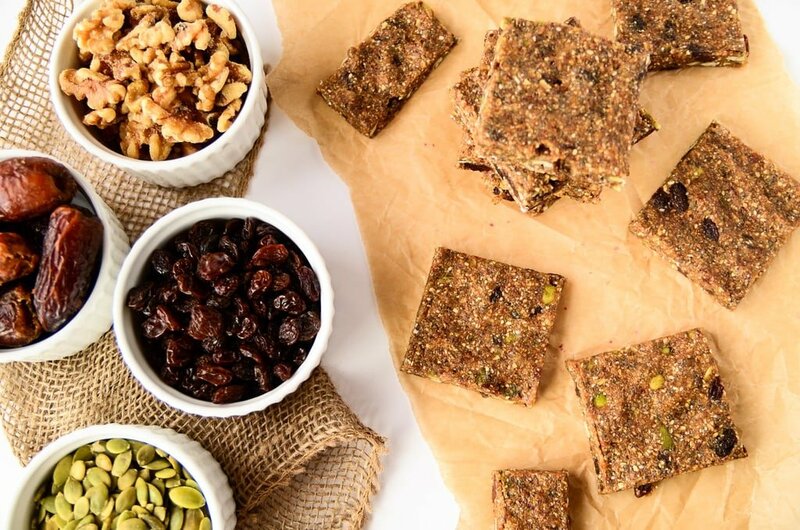 These bars are gluten-free, vegan and have no added oil or sugar. Add the dates, oats, walnuts, hemp seeds, chia seeds, cinnamon, and nutmeg to a food processor. Pulse several times and then process until a crumbly, sticky mixture is formed. Transfer the mixture to a large mixture bowl, add in the raisins and pepitas, and fold to incorporate. Line a 9×13” baking pan with parchment paper. Transfer the mixture to the pan, and use your hands to press down into the pan. You’ll only need about two-thirds of the pan, so push the mixture up against one side of the pan and work out from there, forming a ½-inch-thick bar. Note: if the mixture is sticking to your hands, wet them slightly to repel the stickiness of the dates. Transfer the pan to the freezer to set for 1 hour. Once set, remove the large bar from the pan by lifting up the parchment paper. Slice into squares. Note: I recommend storing these energy squares in the freezer to maintain a firm, sink-your-teeth-in-yummy texture. 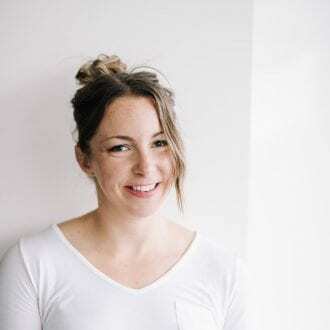 Read more about Ashley on her blog, Blissful Basil or connect with her on Facebook, Instagram, Twitter or Pinterest. Looks like a great snack to have without feeling too guilty about it … thanks for the great guest post Ashley! Great recipe! Am I totally missing it but what is the measurement on the pepitas? Thanks! Hi Rosey, I’m so sorry for the delay! I’ve added the amount for the pepitas, it’s 1/4 cup. Thanks for catching that! 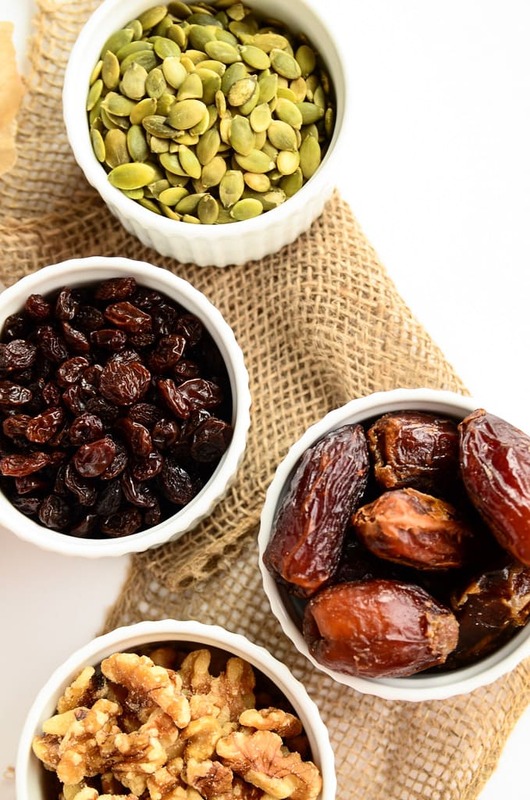 I’m always looking for healthy yummy snacks–homemade is so much better than those store bought bars. These look excellent; going to make some very soon. Rosey (above with question), I’m guessing it’s 1/4 up of pepitas. Thank you for your excellent blog. Hi, I’m sorry they didn’t hold together for you. Did you follow the recipe exactly as it’s posted?